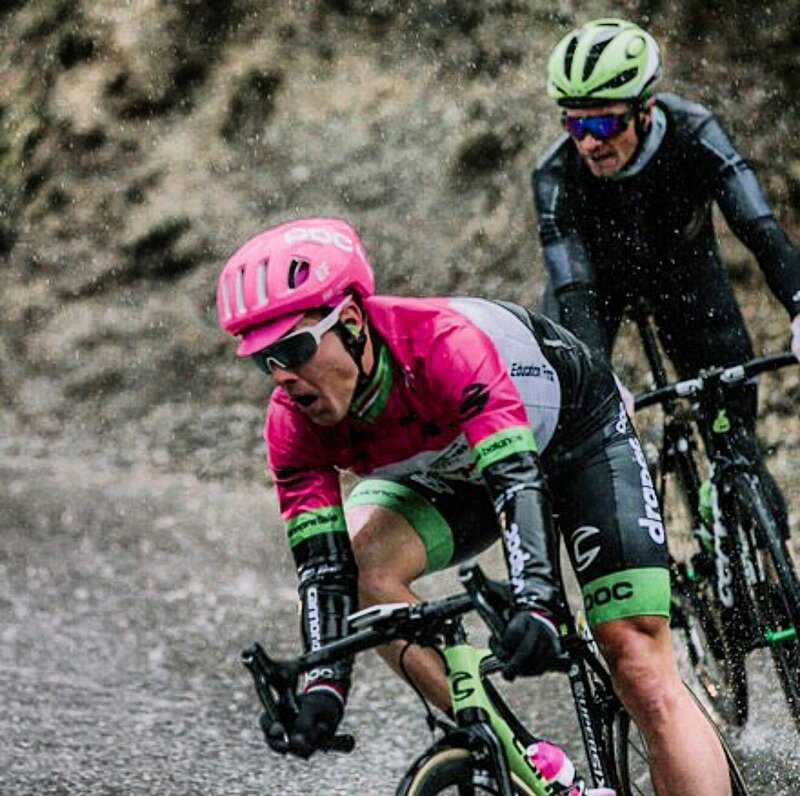 Larry Warbasse said it well, “rainy weeks: when professional cyclists become amateur meteorologists…” Known as “The Race to the Sun,” Paris-Nice can be divided into two parts. 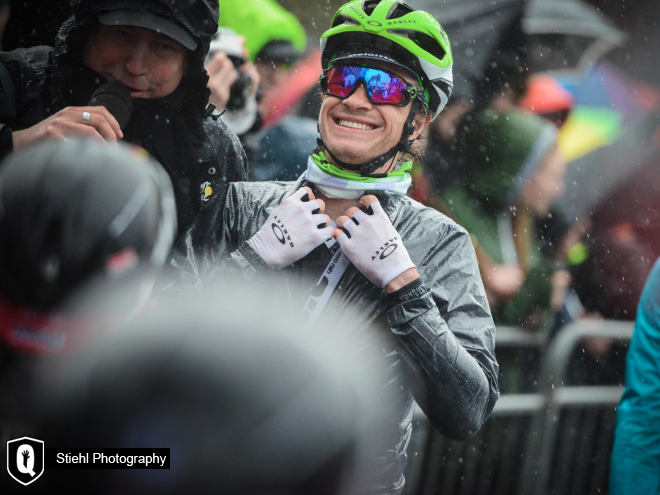 The first three days of abysmal weather, short punchy climbs, haphazard concrete traffic furniture, and nerves simulate the stressful conditions of the one day classics. Mountains welcome the labouring peloton after a mid week time trial. We landed in rain soaked Paris conforming to Larry’s observation- refreshing weather apps- and praying that the professional meteorologists were mistaken. During the brief breakaway scuffle, I popped a tire on one of the random pieces of concrete in the road. When three riders escaped we settled in behind. We were fully wrapped in rain gear, but the frigid rain soon sopped the heat from my core. I had many friends in the peloton but the gloom prevented conversation. About 20 km to go, I stripped one layer of clothing at the team car and saw a rainbow. That brightened my mood. I stuck with Tom Slagter heading into the uphill finish. With three km to go, a crash near the front split the peloton. 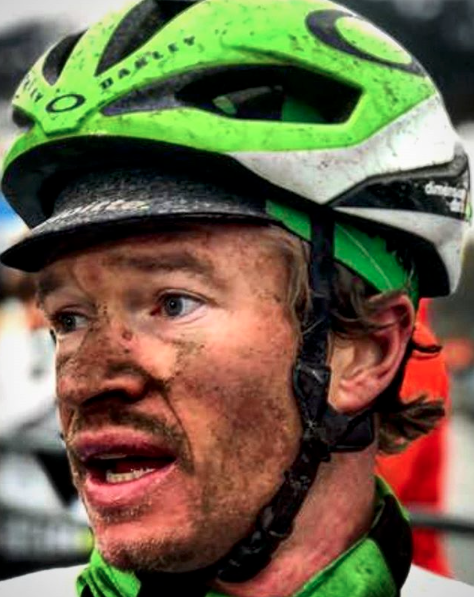 We avoided the carnage but it put us on the back foot and out of the results at the finish. 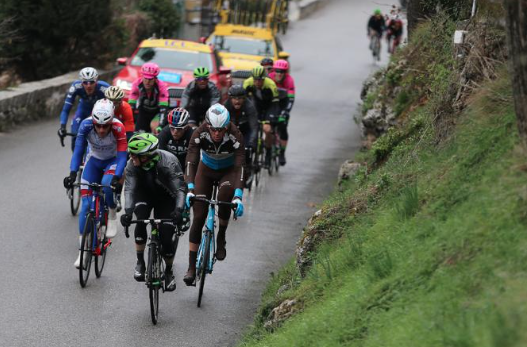 An abnormal wind direction thwarted the organiser’s evil design of a long crosswind stage and for once the collective peloton displayed a glimmer of intelligence. Nobody was motivated to breakaway into the block headwind with nothing to gain. We rode along in utter relaxation for the first 120 km finally chatting and laughing amongst each other. My white socks were stained grey from the day before, and it became a big joke. With 70 km to go, a helicopter hovered into view signalling the beginning of live television coverage around the world, and a group of riders called an end to the truce. They attacked and the frenzy began. The sprinter's teams kept the escapees under control and we covered the last part of the stage so fast. We rode more cohesively as a team, but the nature of the course never offered us an opportunity to bring our sprinter, Ryan, to the front for the final kick to the line. Jake, my brother, said, “I saw you at the back all day,” to which I responded, “Ha, yea, you mean the final 40 km? You wouldn’t know it but I was near the front for the first four hours… Let me explain." Jay Thompson escaped with two other riders, but the peloton drew them in long before the finish. My brakes started making a crazy noise on the steep descents which made the riders around me nervous. They made it a point to pass me on the downhills and stuck me at the back. At the speeds we raced it was a near impossible task to move up for the final climb. On a small hill, I saw one opportunity but wanted to bring Tom Slagter with me. I shouted over to him to follow me, but he was so “in the zone” that he didn’t hear me and we missed our chance. At the front riders attacked. Ahead of me riders dropped the wheel. I sprinted around groups of riders but could close only so many gaps. My fate was sealed. I didn’t want to sulk but I was disappointed in myself. 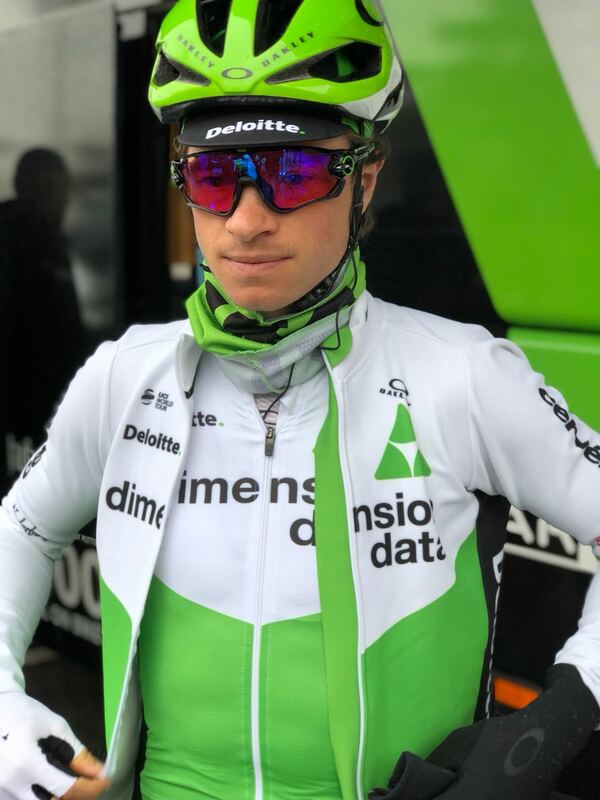 Natnael made the selection and sprinted to 13th. We broke the course into three efforts. 14 minutes up, 3 minutes up, and 3 minutes up, recover on the downhills in between. I found a rhythm and caught the two riders who started ahead of me. I descended at over 50 mph as rain dampened the road. The pure climbers dominated the stage and I finished 42nd. Four riders or more. That was my target for the breakaway. 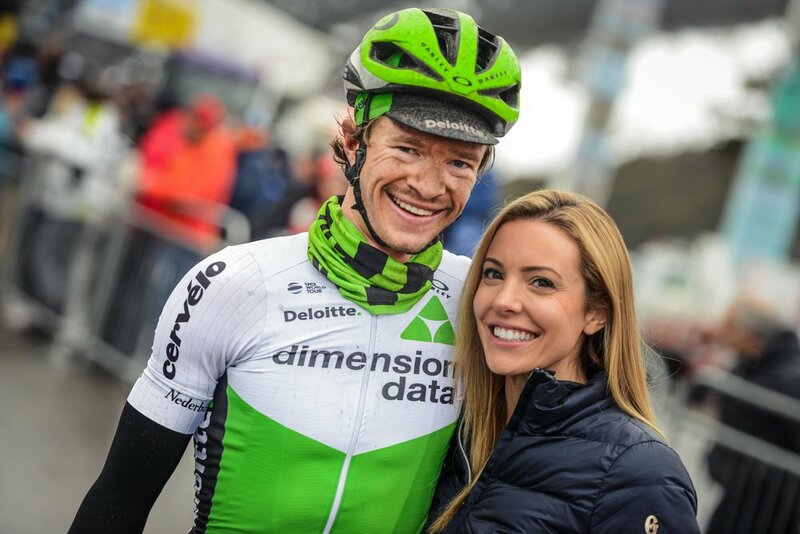 In the neutral zone I heard a Quickstep rider say on the radio, “We make it clear that we don’t let more than five guys go.” That indicated their desire to control the stage. I followed every attack of three riders or more on the uphill start. But, finally three riders rode away from us. Guys continued jumping and I followed. Eventually one more connected with the breakaway, and Astana blocked the road. At the highest point of the race, snow banks lined the road and the slick switchbacks caused crashes. The peloton split into three groups on the downhill. The first two groups linked up, but Jay and Tom Slagter were caught in the third. Suffering over the last two short climbs, I felt like a fish out of water being squeezed until its eyeballs bulge. 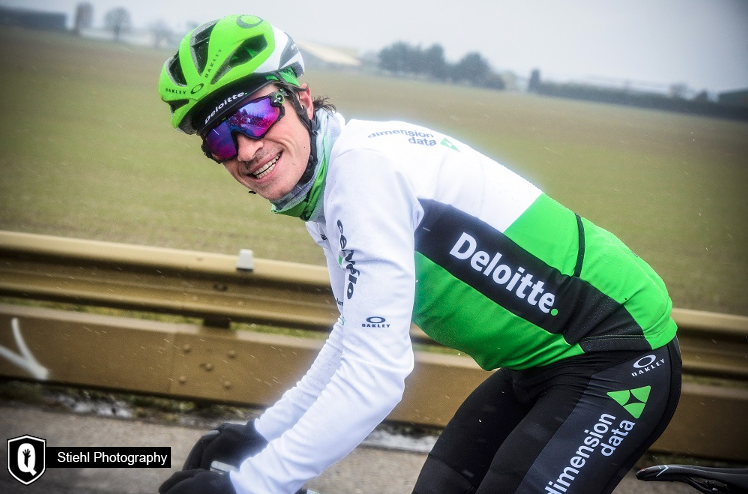 Natnael overlapped wheels and crashed on the uphill, but managed to stay in the reduced peloton. Ryan was hurting so I had my chance to try the sprint. I found some confidence and slotted in behind Demare, the dominant sprinter. 800 meters to go as I was preparing to make a move, I heard the terrible sound of carbon on asphalt. I braked hard and leaned into the rider beside me, narrowly avoiding the crash. I kept my skin but lost the opportunity for a result. To my chagrin, two riders from the breakaway survived by seconds ahead of us and I wished I’d been one of them. That night, a fever claimed Tom, and he abandoned the race. Again, I fought for the breakaway, selecting the savvyest attacks and breakaway specialists to follow. A few riders dangled ahead of us before a turn off the main road. The road split three ways. Attacks flew and then through the radio we heard that we’d actually gone off course. Those of us near the front were furtherest behind when we got back on track and it was a massive chase to come back to the peloton. The signage directing us was unclear and there was no course marshal or referee to point the way. What if a car had been coming down around one of the blind corners? Anyway, back to the race. A few riders near the back had gone the correct way and joined the breakaway. A large break meant a fast stage. I could hardly turn my legs fast enough to follow on the long downhill before the mountain top finish. Again we missed out on a respectable result. The crash as it happened. I'm bottom left looking for a way out! The “Race to the Sun” failed to live up to its name. Rain promised freezing conditions at the altitudes in store. Remembering how the peloton had been fracturing on the downhills, I fought to make room for myself near the front. “Move up now. Show them your balls,” Bingen encouraged over the radio. Rain pissed down and snow melt spat up in our faces. My numb hands fumbled to feel the zipper on my jacket and I couldn’t get it zipped. I shivered on the downhills, but the climbs thawed me. Sure enough on the longest downhill the peloton split into three groups. I was in good position but the first split happened close to the front. We waited for the group behind us and the GC contenders used their domestiques to chase. A few steep climbs on small roads separated us from the final 19 km climb. I won’t downplay the whimpering gasp that escaped me over the last kicker, but I was one of the fifteen or so riders who rejoined the front group of around fifty riders. Unfortunately, I was the only one from the team, and had no reserves to spend on the last climb. I was the 34th rider to weave to the finish. My wife, Jenna, waited at the finish and brought back my smile. People outside the swaying bus held their umbrellas horizontal. The deluge turned the roads into rivers. The first fourteen kilometres were the only flat road of the day and some riders made it their mission to keep the group together until then before turning back to their buses. I positioned well into the first climb where the frenzy commenced in earnest. My legs felt hollow, and I drifted back in the group belligerent yet impotent. 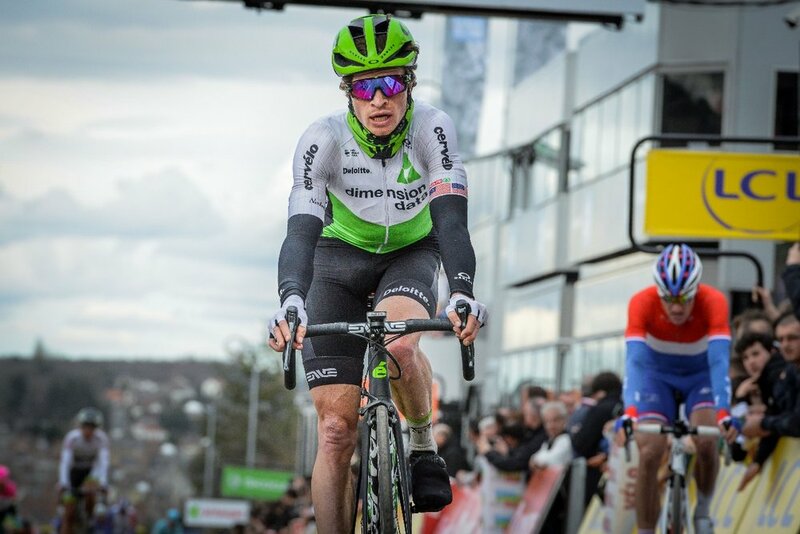 I must have been dropped five times throughout the day, but our Continental tires and Enve wheels allowed me to rally the downhills and rejoin the chase group. 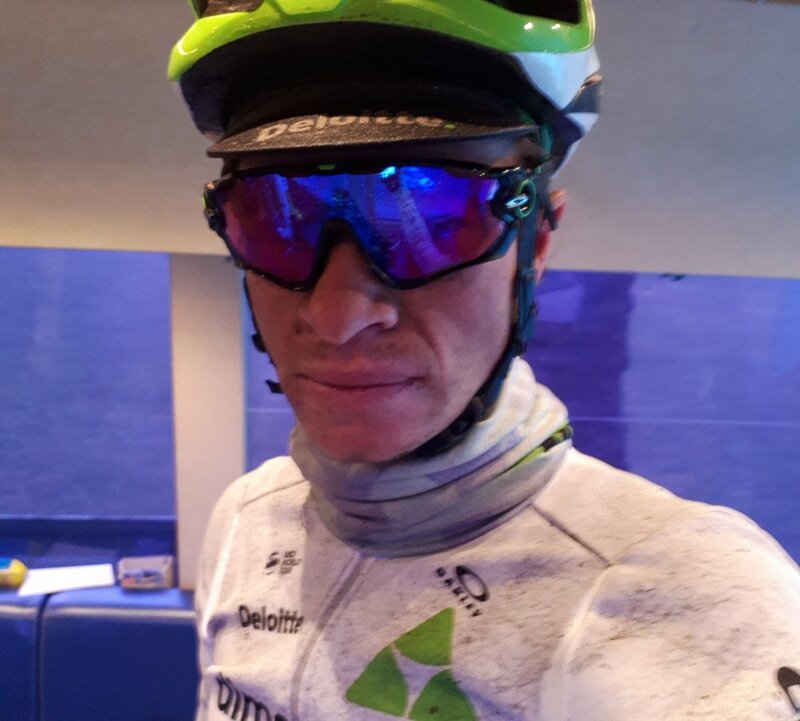 If I have anything to be proud of in Paris-Nice, it is determination, and if two things decide the prospects of a cyclist, it is a positive attitude and determination. If you are still smiling, you’re still in the game. Still smiling. Humor is the best medicine. Following my ex-teammate Sebastian Langeveld down one of the twisty roads. Less than 40 riders finished ahead of us, and just 78 of the 154 starters reached the finish. Natnael finished 34th overall. Serge and I placed 45th and 49th overall. Many teams finished just one or two riders. We finished with five. The optimism of the team never wavered. We have a lot to improve upon, but with these attributes we can hope to step up. This sport is fickle, a rollercoaster of fortune and form. It exposes weaknesses and chisels away fragility. Moving forward we know how to work smarter and better together.